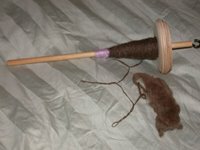 This past week I've done TONS of spinning and not too much knitting. Towards the 5 hrs. per week I committed to do for the Summer Spinning Challenge, I completed 8 hours of spinning....and that's in addition to the 2 1/2 hrs. of spinning I did on Monday with my regular spinning group!) The 8 hours were divided between my drop spindle and two of my wheels (Lennie 2 and Louie). I spent about 1 1/2 hrs working with the drop spindle and 6 1/2 hours with my wheels. As I said before, I seem to be a slow spinner.....but it's a relaxing and enjoyable slow and an excellent way to "de-stress". I did manage to complete spinning singles of the blue merino for my mom. I'd almost finished spinning the singles on Monday, so I decided to finish it off on Tuesday. Wahoo! Now all I have to do is ply it and then select a scarf pattern! I started spinning some white BFL that I purchased from Toni at The Fold in Marengo. It's WONDERFUL to work with....and so soft. I also taught a group of 20 young campers how to spin with a drop spindle. They were all about 9 - 10 years old. It was quite a challenge. It was a bit overwhelming since there were 20 of them and only one of me, but the counselors were quite helpful. The goal was to get each one of the campers to complete some yarn. It would have been better if we had more people so they could get more "one-on-one" assistance, but I think it went over well in spite of it. Plus, kids at that age have very short attention spans, so the important thing was that they tried it and learned something. Since I've been spinning so much, my knitting time has suffered. I've done nothing further on my Maple Leaf socks. 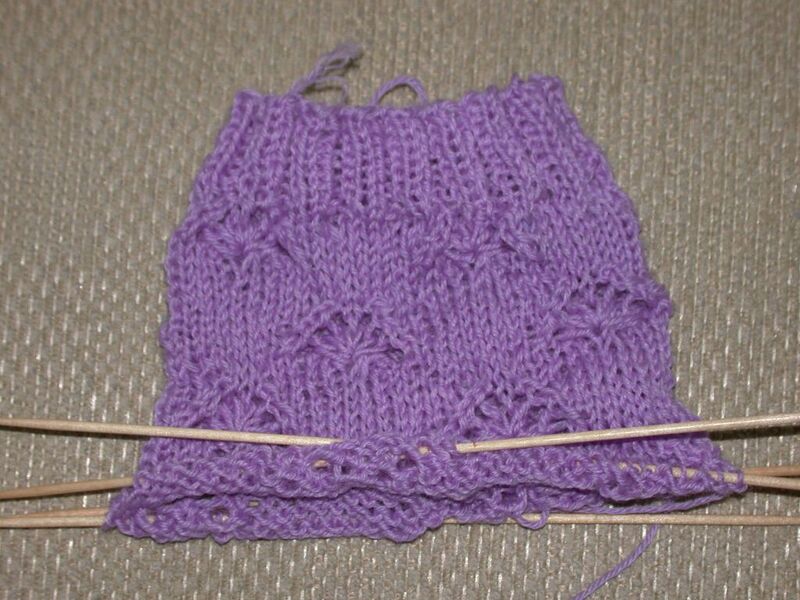 Now, after seeing several peoples completed socks, I'm re-thinking the length of the top....I REALLY like the socks that have 8 repeats of the Maple Leaves....hmmmm.....decisions, decisions! And.....I've only managed to complete 40 more rows of my Bertie scarf. I really want to complete it as soon as possible. My mom has been diagnosed with breast cancer and is having surgery tomorrow....this scarf has become my personal symbol of my mom's bravery. Please keep her in your thoughts and prayers. 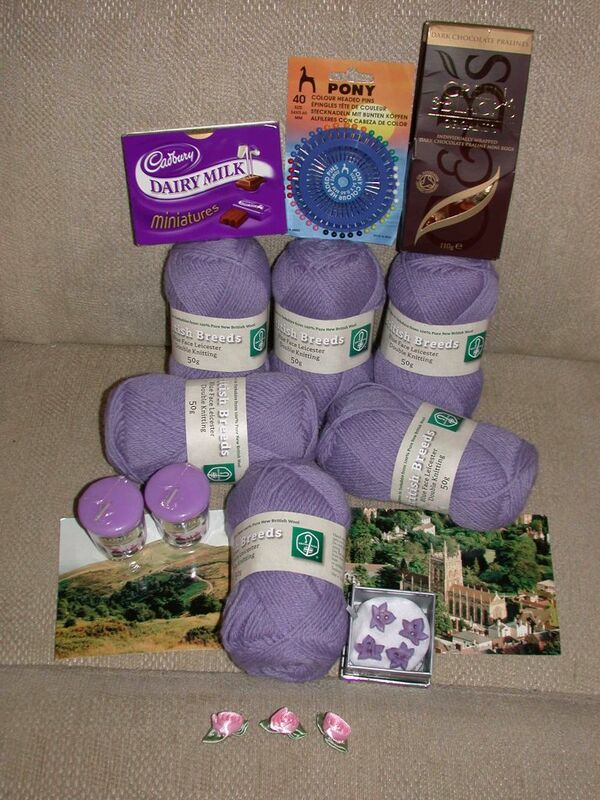 Oh What a Wonderful "Secret Summer Santa"
This is so exciting - I've NEVER received a package from the UK before and today, I received a WONDERFUL package from my "Secret Summer Santa". I just love my presents! 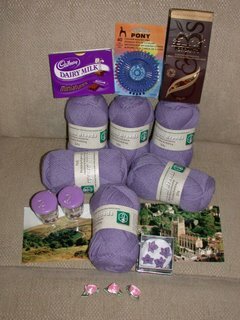 My secret pal did a fantastic job "stalking" me - she knows I love chocolate and purple! All my presents were wrapped in purple paper too! 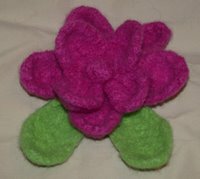 I just love the BFL yarn....it's sooo soft and the perfect color too! I'm not sure what I'll make....there's enough here for me to tackle any number of projects! The chocolates look wonderful.....but I don't want to spoil my dinner by getting into them just yet. The "wonderful smell" that I discovered is from the French Lavender scented candles (purple, of course!). Lets, see....oh....I also got some wonderful pins - this is great as I can't really "pack" my pin cushion in with my knitting, but these pins have a flat "case" that will fit nicely in my notions bag! Finally, there was a little box with some fabulous finishing touches....some pink satin roses and some purple star buttons. Secret Summer Santa....did you make the buttons? If so, I'm truly impressed! I love them! 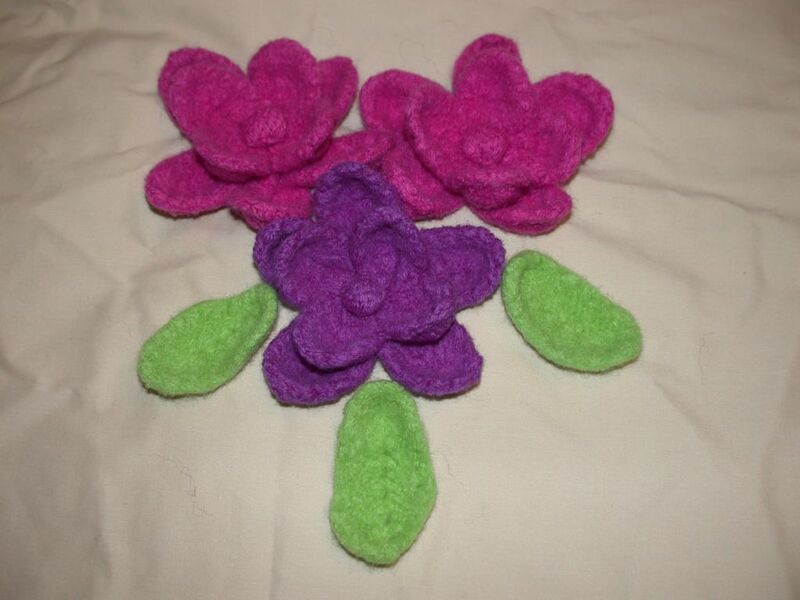 Now I need to find a project worthy of these wonderful embellishments! Thank you! Thank you! Thank you! The final bit...guessing who my "Secret Summer Santa" is. 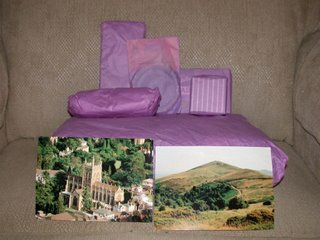 Hmmmm....my clues were 2 postcards.....one of the Priory Church in Malvern and one of Worcestershire Beacon and Sugar Loaf Hill. I'm guessing it's "Liverbird"....am I right???? UPDATE - My "Secret Summer Santa IS Liverbird!!!! Thanks again for the wonderful gifts! Many thanks to Tess and Klyve of Angel Yarns for hosting Angel Yarns Forum and allowing us to host our "Secret Summer Santa" and thanks to Bertie and Bronte for organizing it! My friend, Paula, is just amazing! She's so talented! We agreed to a "swap" - she would paint a stool for me and I was to make the felted Brainwash Bag for her. 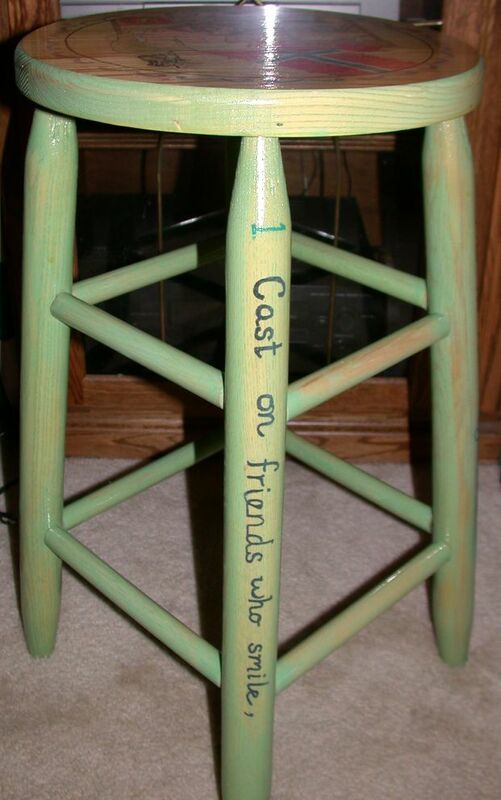 I was definitely the one who got the prize - the stool is absolutely magnificent! It's the perfect height to act as a little table - for holding your beverage (on a coaster, of course! 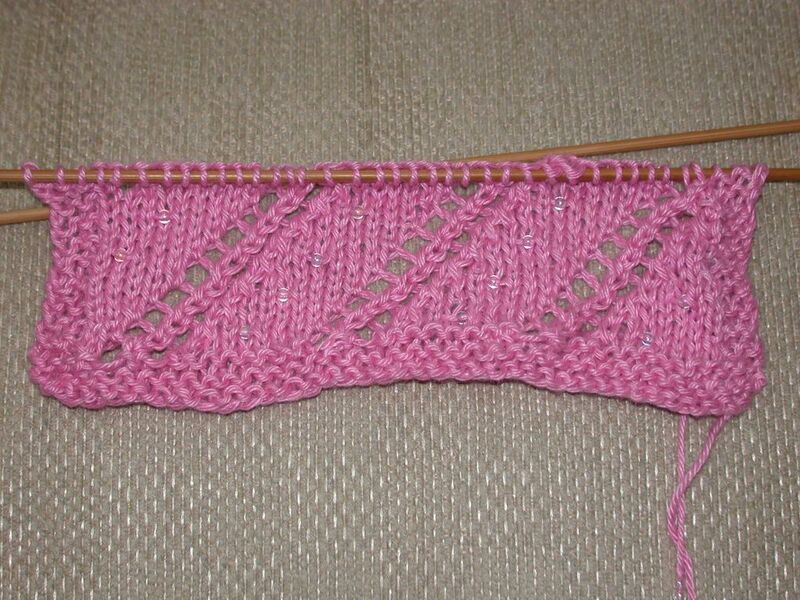 ), a novel, or a pattern that you're currently knitting. The level of detail is phenomenal. 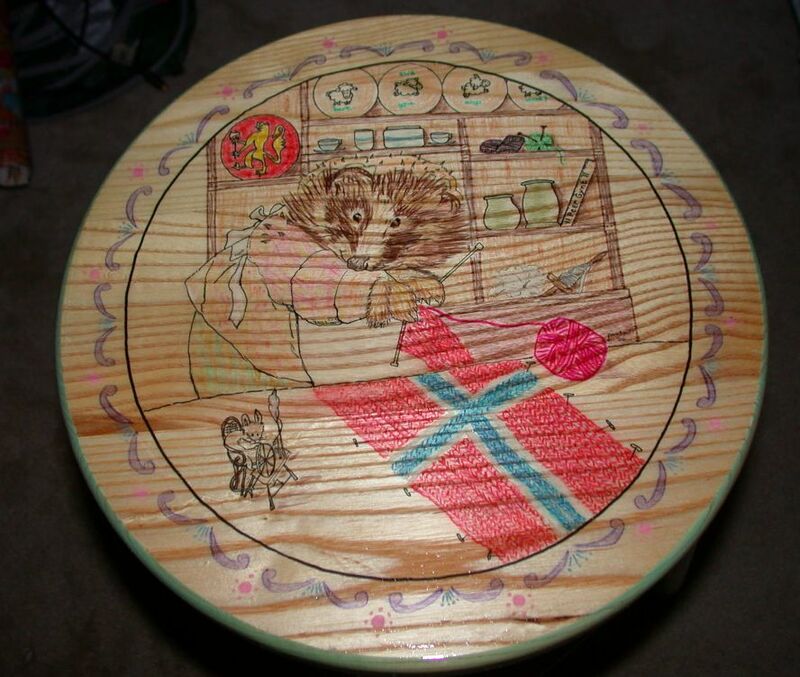 I love hedgehogs....there is a KNITTING hedgehog on it! 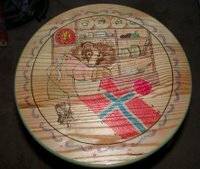 She celebrated my Norwegian descent with a knitted Norwegian flag and Coat of Arms. There are also little details on the shelves...like coffee cups (I'm the java queen), little sheep (with the name of my blog), a drop spindle full of yarn, etc. The Tailor is even evident at a spinning wheel! With a warm intarsia sun. Spinning update - I've managed to work in 5 3/4 hrs. of spinning this week....in addition to my regularly schedule bi-weekly spinning sessions. I've finished spinning and plying all the coral colored Merino. The big question is, what to spin next? Hmmmm....what a dilemma! 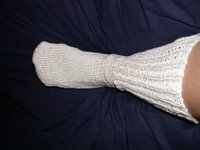 Maple leaf socks - I've completed the 6th repeat of the pattern......thinking about starting the heel flap now. 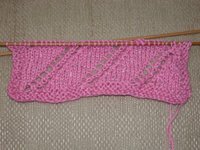 Bertie-A-Long - I've made great progress on the scarf! (It's about time!) 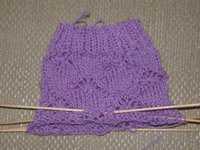 On Sunday, I had to rip back about 25 rows due to a very obvious error. Today, I only had to rip back 2 stitches....that was easy. My other mistake is VERY hard to see.....and since I'd made so little progress early on, I decided I could live with that one! Perfhaps it will be a "finished object" by the end of the month! Keep your finger's crossed! Oh... I spent a LOVELY day at Misty Mountain Farm on Monday.....fondling yarns and fibers. They have some gorgeous handpaints! I even went up to the barn to see the goats and the Finn sheep.....and the resident Llama with the eyelashes that just don't quit! Oh...the dogs and puppies captured my heart as well! I am so pleased with how this came out! I love it! 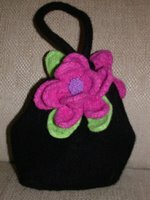 The design is wonderful...and the flowers are so versatile....I envision myself using them to embellish other bags. 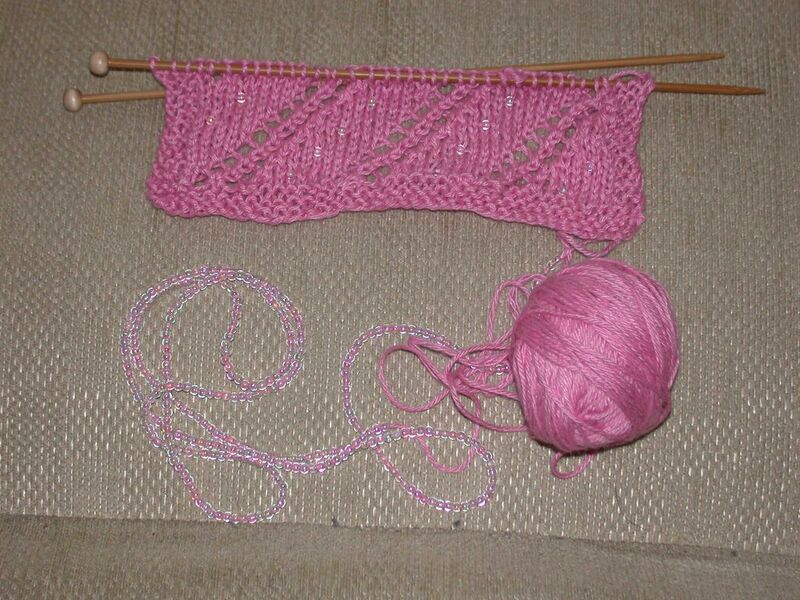 I've made a bit of progress on my Bertie scarf. 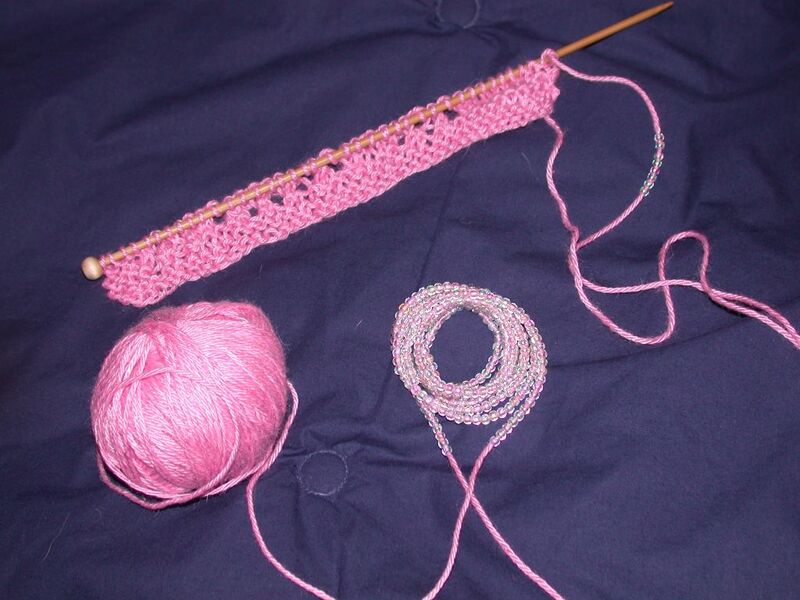 I ripped out two rows to correct how I handled the beads and then proceeded to knit 14 rows. After looking at it, I realized I didn't like how the SKP looked - I'd used "slip as if to purl". So....I ripped it all out and re-worked it. 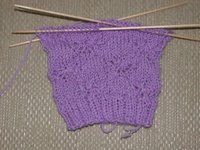 This time, I used "slip as if to knit". I like it MUCH better! I've finally made a little more progress with the Maple Leaf KAL sock - I ripped out both the versions on the size 2 (too big) and the size 1. 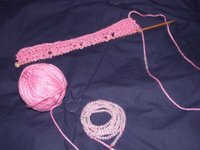 The size 1 had the same issue as my Bertie scarf....I didn't like how the SKP looked. On this latest "re-work", I've completed 3 repeats of the maple leaf and am 1 row from completing the 4th one. 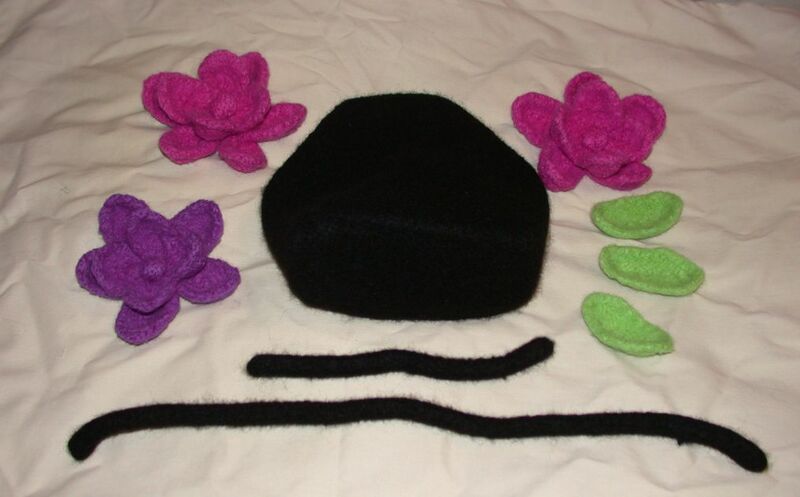 It look soooo much better using "slip as if to knit"! In addition to the Summer Spinning Challenge, I spun for 3 hours at my Monday night spinning group - concentrating on the blue multi-colored Merino for my mom. I really am a slow spinner.....I didn't even totally fill a bobbin in that time. In my defense, though, I do spin relatively thin yarn. Noni Bag Parts - I still have to sew it all together! ARGH!!!! Generic brown fleece I'm spinning with the drop spindle as part of the "Summer Spinning Challenge" and a close up of the sock I'm knitting in Wildfoote for the Maple Leaf Sock KAL. Finally, front and back views of the "Bertie Scarf" from the Bertiealong KAL....I have to rip out the beading row as it's not done properly....you can see the beads on the BACK but NOT on the front! I also completed knitting the "ugliest socks in the world" - these were also a TOTAL pain in the back side to knit. My DD wanted these because the toe area is sooooo nice and roomy and she envisions slipping into them when watching TV. 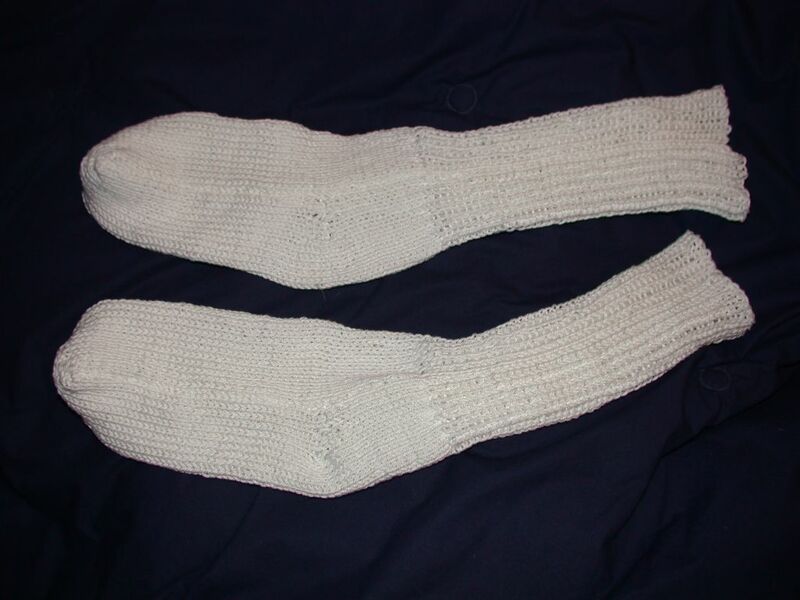 I told her the socks are knit too big and won't be very comfortable....plus, it's got SEAMS down not one, but BOTH sides! It's a Jo Sharp pattern from Contemporary Knits. Never again!!!! Finished Felting the Noni Bag! 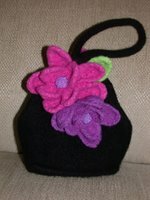 I FINALLY got around to felting the various parts of the Noni Bag. They are currently in the process of drying. I shaped the bag and stuffed it with paper, so hopefully, it will dry in its proper shape. The holes in the petals and the leaves didn't totally fill in, but I like the effect - I think it's more interesting that way. It will take these a while to dry....and then, I have to attach all the pieces to the bag. 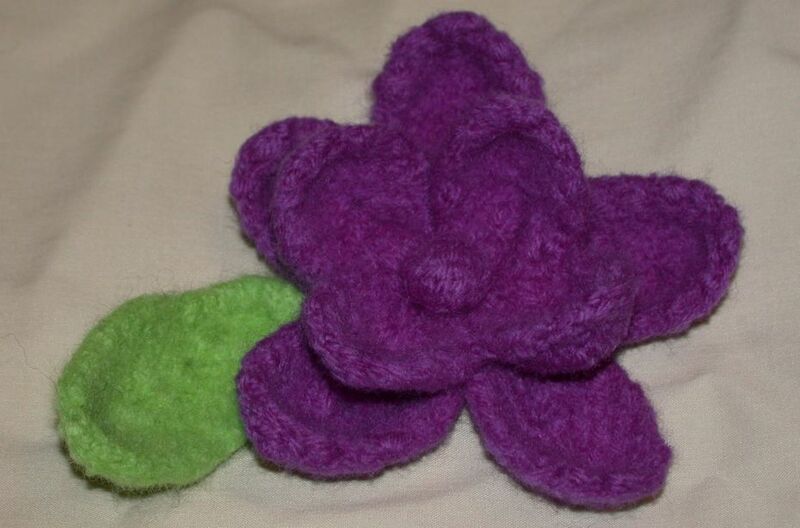 I also haven't decided whether or not to bead the leaves and the center of the flower. Decisions, decisions, decisions. Spinning....I completed week 2 of the "Summer Spinning Challenge" and managed to stay on track - 5 1/4 hrs. of spinning. However, week 3 is coming along very slowly. I spun for 1/2 hr. yesterday on my drop spindle, but have not done any spinning today. Knitting - I started the Bertie Scarf (after stringing all my beads onto the yarn). 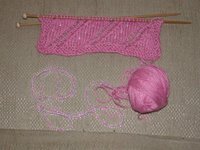 However, I need to re-do the first row with beads. I went full speed ahead without reading the directions carefully. Yeah....you guessed it....I made a mess of things. Oh, well. That gives me something to do "in my spare time", right? I also started my Maple Leaf socks for the KAL. 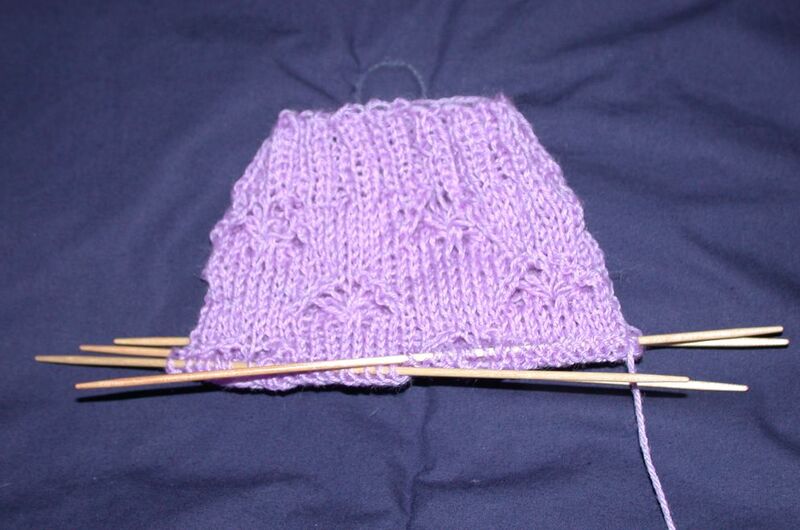 I started one sock (on size 2 needles out of Lilac colored Wildfoote) and discovered it was going to be huge! So....I started the second sock - this time on size 1 needles. 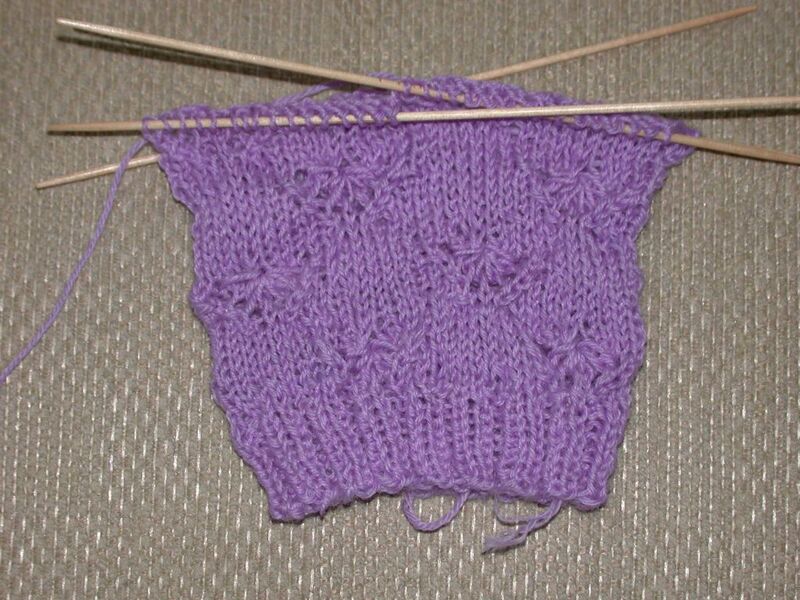 I think the smaller needle will produce a better fitting sock. My secret pal is absolutely amazing! Check out the wonderful goodies she sent for July 4th - can you believe it? Flip-flops; a flag retractable tape measure (always very handy! 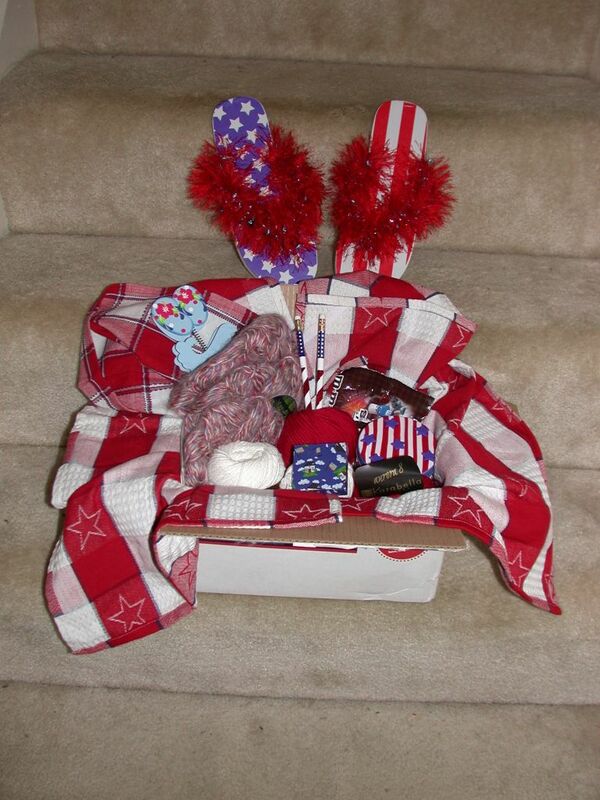 ); patriotic pencils; a cute patriotic storage bin suitably decorated for the 4th (SP - did you decorate this? ); not just one, but two big bags of M&M's; a cute clippy thing for holding a recipe card or photo; and last but definitely not least, several skeins of yarn - appropriately themed of course - gorgeous red Karabella Aurora 8 (Merino.....yum!!! ), some crisp white Sugar 'n Cream, and some very patriotic red, white, and blue Ardilla New York Mohair/acrylic blend. Oh....it was all wrapped in the Red/White/Blue linens (I'm planning to use them as place mats.). 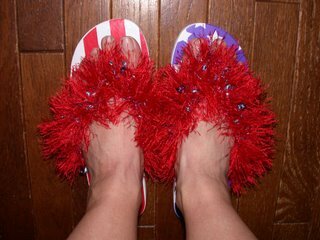 Here's a close-up of the flip-flops. They fit PERFECTLY! Aren't they darling? Besides the fun fur, she's added some red, white, and silver beads. I feel so special!